Perhaps everyone knows how glaciers work…a lot of snow (and I mean a lot of it, up to 50m to gain a compressing weight of its own) compacting into the ice with gravity pulling this mass down the hill. It may however be a bit harder for everyone to imagine the scale of the area where all this compacting happens. Franz Josef Glacier is one of the smaller glaciers by world standards but quite a sizeable chunk of ice in New Zealand landscape. On this photograph I’ve been hoping to show the vastness of the upper parts of this currently about 10km long glacier. 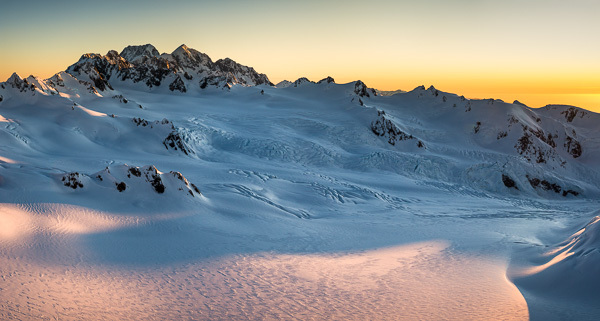 With 2 highest peaks of the New Zealand’s Southern Alps dominating the background – Mount Tasman on far top left 3,497m and highest mountain Aoraki/Mount Cook 3,724m next to it on right, the vastness of the Geikie and Davis Snowfields of the Franz Josef Glacier is quite apparent. This wonderful scene has been photographed just as the sun was dipping over the horizon of the Tasman Sea on right and I love the beautiful light bouncing over about 30 square km large NEVE in wonderful hues of purple, pink and orange. Hope you enjoy this image, too. Thank you. This entry was posted on 28/10/2015. It was filed under Glaciology, Photography and was tagged with crevasses, Franz Josef Glacier, icefield, mountains, Mt. Cook, Mt. Tasman, NEVE, New Zealand, photography, The Southern Alps, Westland NP.